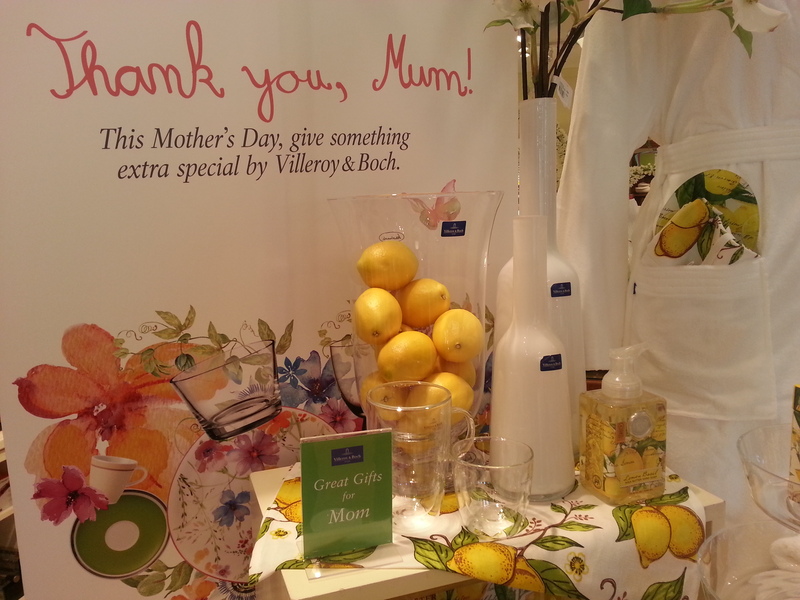 Villeroy & Boch Mother’s Day gifts bring elegance and grace together! My mother has for the past several years, always asked for one thing (other than a silk sari which she gets anyway) for Mother’s Day- an additional piece to her amazing collection of Villeroy and Boch products. For years my mom has entertained hundreds of family and friends with the stylish, alluring and durable dinnerware that she often refers to as “a work of art”. I remember as a kid growing up how decorative tabletops were common in our household and how mom always took pride in creating them for whenever she would invite family or friends over during the holidays or for special dinner parties. Since my mom loves to cook (and is damn good at!) she entertained a great deal always using the luxurious and colorful brand. Villeroy and Boch have been around for over 260 years and the German company, known for their bold and vibrant colors, stunning stylish designs and devoted followers (like my mom), have geared up to help celebrate Mother’s Day 2014 by offering moms all over the world more designs, ideas and choices for creating beautiful tableware for family and friends. 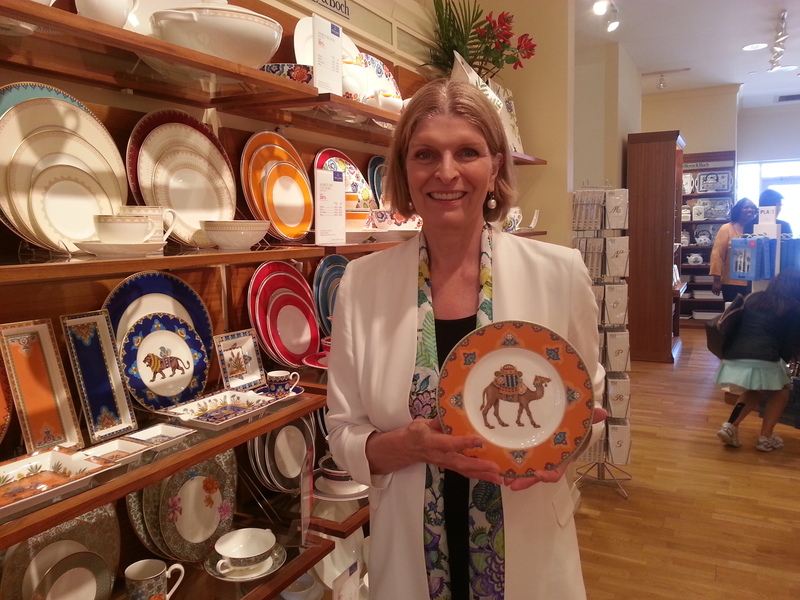 So you can just image how excited I was when I found that Isabelle von Boch, an 8th generation descendant of the internationally renowned Villeroy and Boch family was coming to Princeton, NJ to share her personal creativity and inspiration for creating the family friendly dinning table. 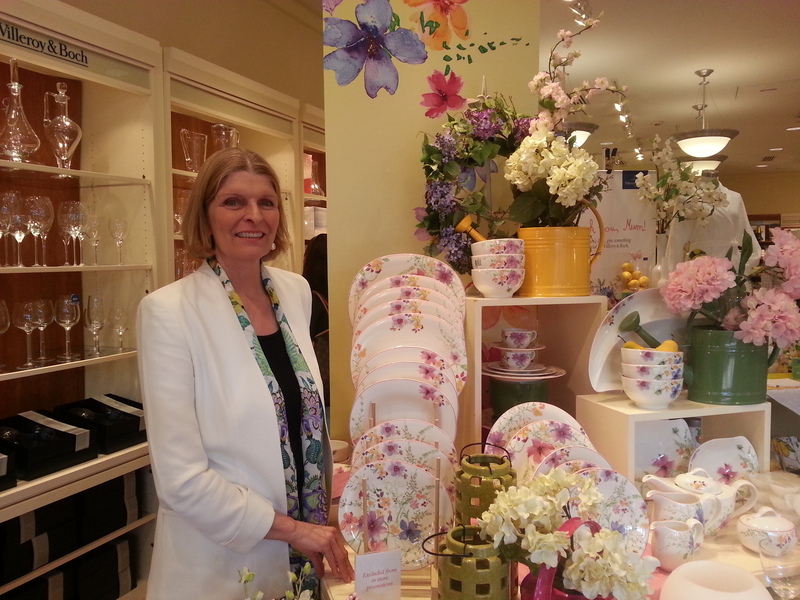 The Ravi Report caught up with Ms. Boch to get the story behind the fascination of Villeroy and Boch. RR: A true honor to meet you Isabelle. You are known as the guru in the tabletop industry and you share with people all over the world such creative ideas when it comes to tableware. Please tell me a bit about your mission in the ever-changing tabletop generation. IVB: I feel like a missionary that inspires people. My biggest wish or rather desire is to inspire people. It’s not about selling, it’s about inspiration. People can make it (Villeroy and Boch) part of their lives in so many easy ways. People are sometimes not aware of the personal and immense impact of using a beautiful cup or stylish place setting for their family dinning. RR: Your travels have taken you around the world where you offer tips, ideas and creative suggestions for the tabletop. In India for example, you are revered for your inspirational ideas when it comes to designing the colorful dinner tabletop. Why do you think there is such a strong brand connection with Villeroy & Boch in the international scene? of our customers and everything we do has an emotional quality. When people connect with our colors or design, they also connect with the European part of the culture. People in India buy Villeroy and Boch because they want to be part of the rich European culture. RR: I also think it may have something to do with the strong bond that Indians have with Germans. IVB: Exactly. Indians connect with Germans on many levels. They love Germany, they love the people, there is a very strong connection between the two cultures. Our artwork being perfect, the shape being perfect and the technology being perfect is why we do very well in India. Also, when I was in India recently, I saw that color schemes and the strength of colors is what people really relate to in what we offer them. What we make is relevant to people’s lives and we try to make people understand that. RR: Please if you will, give me an example of your own personal creativity that people have followed and how you think it impacts in the world of tabletop design? IVB: I think examples like collecting different placements which lead to creating a different atmosphere for each meal is important. Have a different one for lunch, dinner, etc. Just like you change your clothes, placements are the clothes of the table and dinnerware should not be boring. Add some crystal glassware or flowers as well. It’s not about spending money, it’s about the table coming alive during dinner and holidays. Also, I have said that bone china can be used on any occasion, not just for holidays. 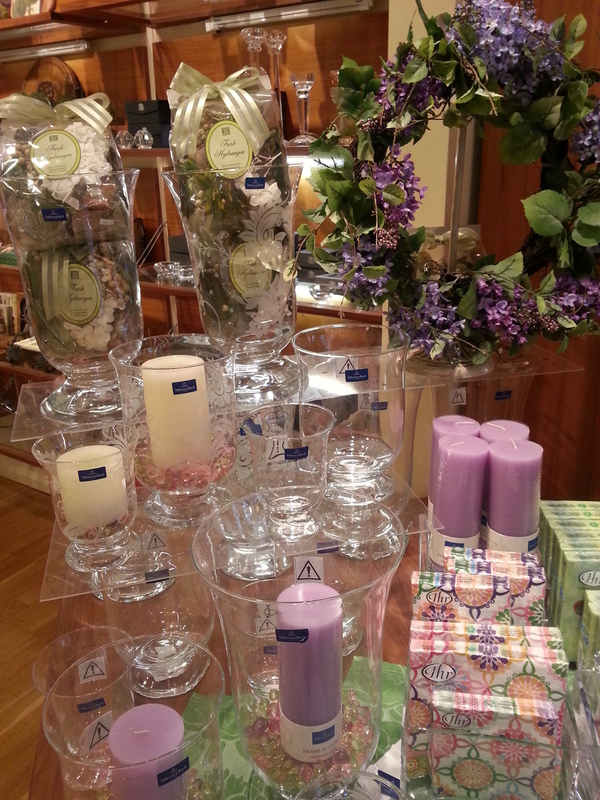 The Villeroy & Boch store brings hints of European flair to Princeton, NJ. RR: Tell me a little about the stunning color schemes in the products and why they do so well. IVB: Our colors schemes are bold and strong and we are not afraid to make a statement. Each one of our patterns has a personality so to speak. People who are afraid to make a statement about themselves, are not our customers. People want refinement! We are in the business of creating ambiance and creating a way of life for people to communicate, socialize and bring the family together. Dinner is about socialization, connecting the family and not just about beautiful plates. RR: My mom who has been a life long devoted fan, says your products “keep the family together”. Your thoughts? IVB: Correct! I am about the family that eats together and stays together. I stress that all over the world when I visit people. RR: Thank you Isabelle. Such a pleasure and an honor to meet the woman behind such an amazing brand. IVB: Thank you so much. 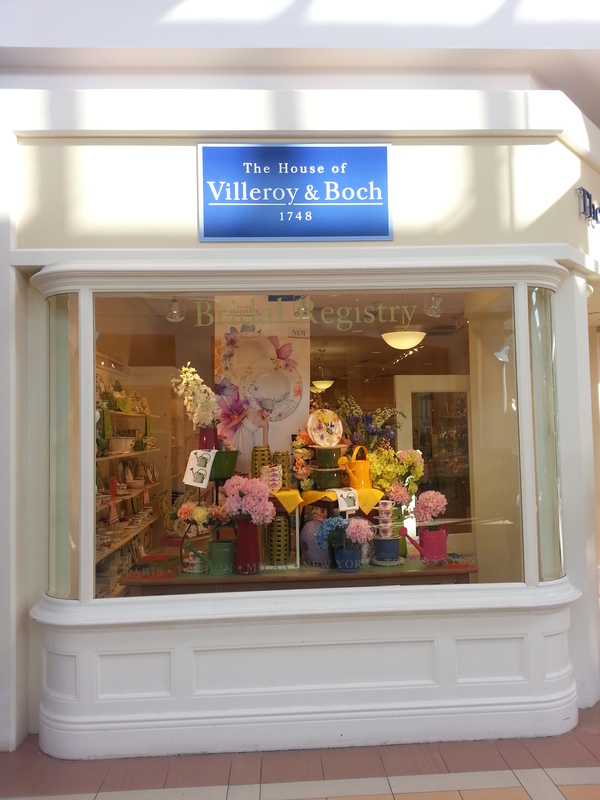 The Villeroy & Boch store is located in the Princeton Market Fair Shopping Center. For more information, please visit www.villeroy-boch.com. The journey continues and for Mother’s Day, it’s going to be a stylish one for sure! Fashion devotees of John Varvatos recently had the chance to see the iconic designer up close and personal in an engaging conversation between the exemplary designer and the world-famous fashion personality Fern Mallis at the historic 92Y venue in NYC as part of the well received series “Fashion Icons with Fern Mallis”. 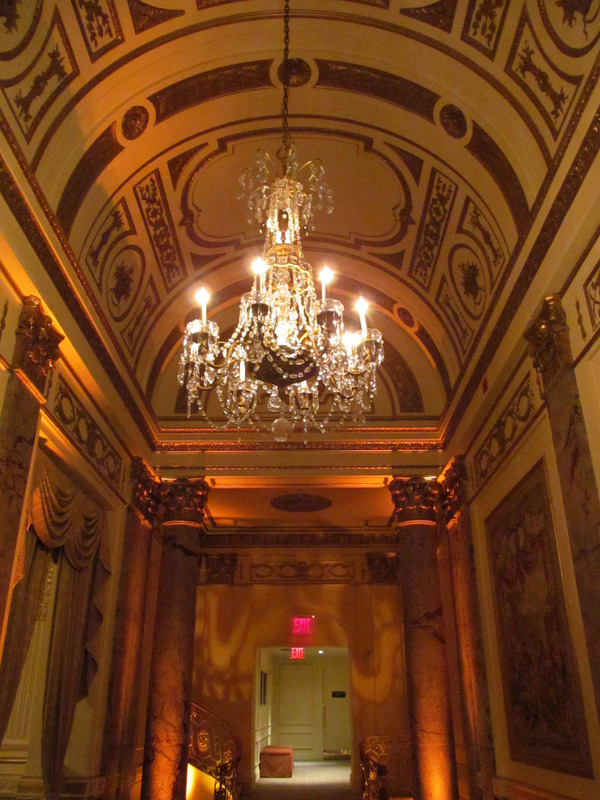 For years, the 92Y has been known as a world-class nonprofit community and cultural center that has served as a place for NY audience members to experience personal interviews with some of the leading personalities and celebrities from the world of film, fashion, business, entertainment and publishing. The Ravi Report was front and center to bring all the details. Varvatos menswear fashion and accessories are globally known for their stylish, stunning and alluring designs that are sought season after season. I have a shirt and trust me, the man is a genius when it comes to fashion. Over the past several years, the designer’s passion for music and writing had turned Varvatos into a leading author and somewhat musical talent scout as he brings very talented musicians to his Bowery Store in NY to perform for rock music fans. I’ve been to a few concerts and it is a great concept and the musicians are very talented! 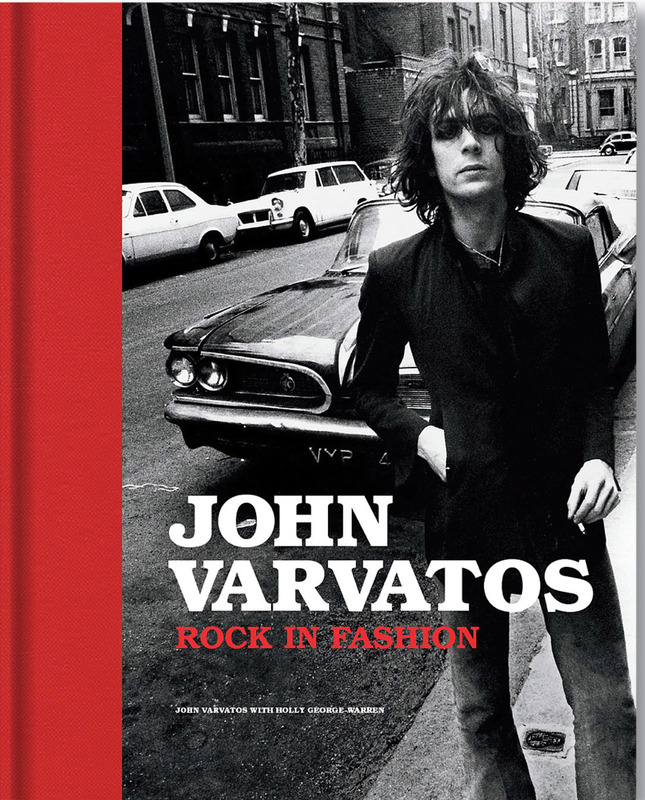 Varvatos’s new book Rock in Fashion, (which is selling like hotcakes) is a collection of his own rock style designs and personal notes from his years of designing memorable clothes. You are definitely going to want to get this book folks! But despite the designer’s immense fame, fortune and massive following, the Detroit born Varvatos remains humble and grateful to those that have helped him achieve his fame and success. I will also on record saying she is one of the nicest and most helpful people in the fashion industry I know. During the on stage conversation, Mallis , who is an excellent interviewer, gets Varvatos to open up about his family, his humble beginnings in Detroit, his career in fashion and of course his passions which include music, writing and designing cars! The Ravi Report caught up with Varvatos after the talk to find out what keeps the world-famous designer going and what kind of outfits would he design for Bollywood stars. RR: John, great seeing you again. We learned so much about you during the discussion. You just keep going from one project to another. How do you manage it all? JV: I feel like I have to learn something new everyday. I am a sponge for learning things. I want to know everything and anything that pertains to my world and I go for it. RR: A lot of your followers are saying that “John has done so much and continues to reinvent his passion.” Your thoughts? JV: Well, that is a nice complement. I think the word you use is passion and that is the reason you keep going. I don’t even think about it...it’s the stimulus in life that is your passion that keeps you going and keeps you motivated and keeps you looking for the next adventure. I would be bored if I was not looking for the next adventure. RR: Everything you explore and do seems to have a tremendous successful outcome with no room for failure. Has that always been the case? JV: (laughs)…there are always bumps and road blocks in the road that people don’t see and if you have this attitude that you can climb over the road block and you can knock it down, you can do it. A few years (in 2008) the economy for all of us was a bump in the road. No matter what you did, it was a bump in the road. You had to figure out how you were going overcome it and come out stronger and better than before. For me it was not going to let me down just because we just got punched in the stomach. What can we learn from this experience? What is going to make us stronger? So if it happens again, we can be in a much better place. RR: You have a large following almost a cult like one in Bollywood for your fashions and accessories with many stars wearing your clothes to parties, red carpet premiers and events. If you had to design an outfit for the leading men of Bollywood, what would you design? JV: (Pauses)That is a really an interesting question. Today we were talking in our meeting on what the next inspiration would be for our runway and we are planning on going to India this summer for an inspirational trip. There is a culture out there from everything from the intellectual flourishing artesian culture to amazing fabrics and it’s one of the places where people take pride in what they do. I would design something that would be inspired by Indian culture. RR: Thanks so much John. Always a pleasure and hope to talk to you again soon. JV: Thank you so much. The journey continues and for John Varvatos and Fern Mallis, it’s one full of fashion, design and adventure for sure! The Oscars will be a bit bitter-sweet this year. Not because some of the most amazing films or actors were not even given a nod nor will it be because some of them were given one. It will be because a leading member of the Hollywood film fraternity will no longer be among his peers cheering them on as they sit in hopes of winning the most prestigious honor in cinema. By now, many of you already know who I am talking about but I will be more than honored to mention his name just in case some of you may not know. I’m talking about Academy Award winning Philip Seymour Hoffman, one of the greatest American actors that Hollywood will ever see. The 46 year-old brilliant and gifted film and theater actor passed away on Feb. 2, 2014 from an apparent drug overdose. It was sudden. Shocking. Tragic and of course disturbing. Hollywood lost a great actor and three kids lost their loving father. I’m not going to sit here and write about what has already been written about the late gifted actor over the past several weeks including everything from drug abuse to the details of Hoffman’s will. However, I will say that the actor’s death has brought serious attention (again) to the ongoing issue of the dangers of drug addiction and how prevalent and on the rise it has become. According to a recent New York Times editorial written by the well-known and astute NY ER physician Dr. Robert S. Hoffman, heroine-related deaths have increased 84 percent from 2010 to 2012 in New York city. Dr. Hoffman also states that the actor’s sudden death was more of a “wake up” call for society to try to help prevent the hundreds of other unknown deaths that are never mentioned or talked about. 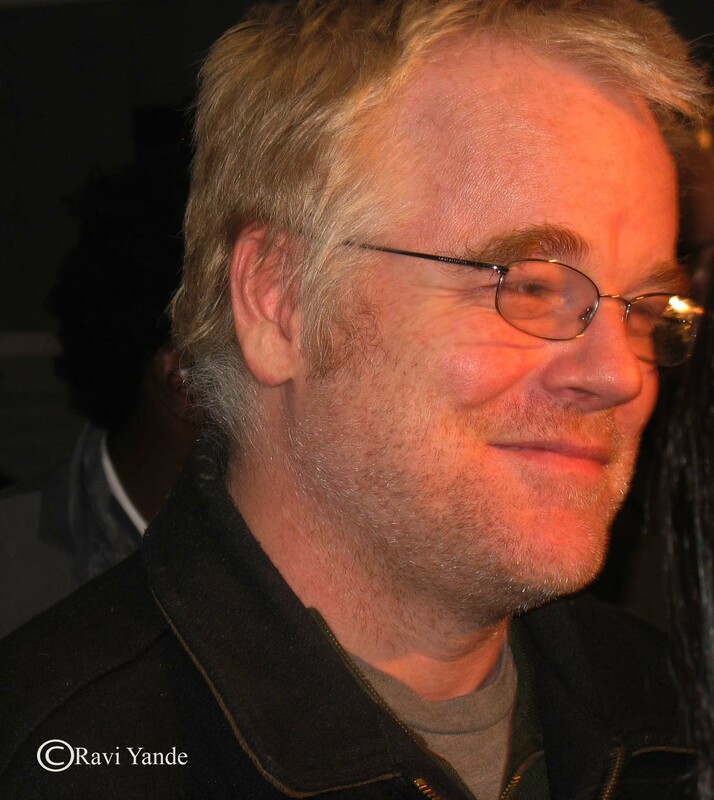 Philip Seymour Hoffman took Hollywood by storm with his innate ability to dig deep into the core of his being to bring to surface the kind of immense talent that only a few privileged individuals are blessed to achieve in a lifetime. My first introduction to Hoffman was from the powerful film Magnolia. The deep and emotional 1999 movie centers around 9 individuals with various levels of dysfunctional issues. Hoffman stars as the hospice nurse Phil who tries to reunite a son (played by Tom Cruise) with his dying father. Although it was clear that Tom Cruise was the protagonist in the film, Hoffman gave the kind of performance that not only made Hollywood take notice, but also gave the world the kind of versatility and gut-wrenching performances that only a few gifted actors can achieve. Magnolia was the reason I watched all of Hoffman’s films and I, like millions, was able to see how over the years, the simple and unassuming actor transformed into a megastar by portraying versatile characters that quite frankly, were tailor-made for him. Hoffman won an Academy Award in 2005 for his brilliant performance in the movie Capote. Who can forget that heartwarming speech afterwards in which he thanks his human rights lawyer mom, Marilyn Hoffman O’Conner for taking him to his first play as a child. Not a dry eye in the house when he spoke. 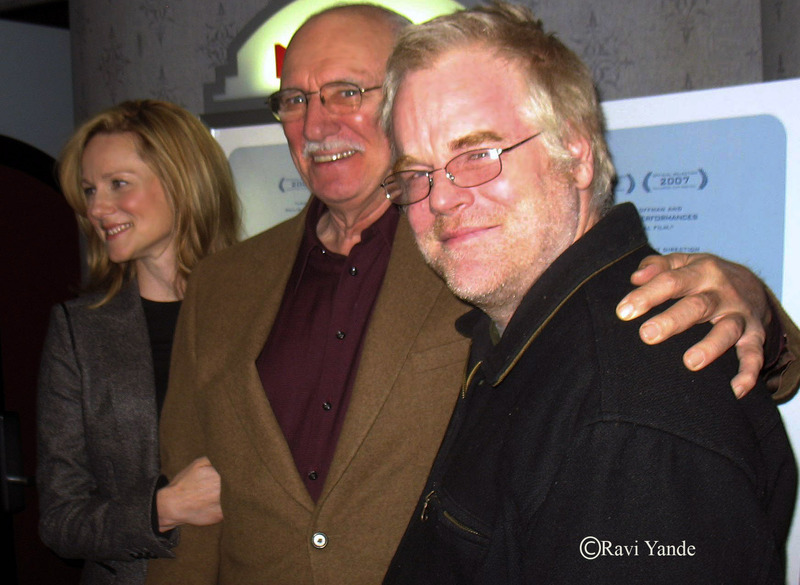 I was privileged to have met and interviewed Hoffman in 2007 at the NY premiere of Savages. Hoffman along with the stunning Laura Linney play brother and sister in the movie who end up caring for their abusive and ill father played by the brilliant Philip Bosco. It’s an emotional family drama that is certainly a must watch. I’ve seen it twice. Hoffman was indeed one of the most sincere, humble and intelligent actors I had ever met. RY: How did you prepare for this role? Did you draw anything from your own life experiences? Hoffman: You prepare for it like you prepare for any part….it’s always different yet always the same and you know that’s a long conversation..it really is…it’s not something you can just sound bite…it really is..there is a lot of questions and a lot of thought that goes into preparing for something. RY: What did this role do for you artistically as an actor? Hoffman: Wow..(pause)…I have no idea…very deep question. Probably nothing…(laughs)..well it’s just another opportunity to explore something that I find pertinent that interests me now …do you know what I mean?… which I hopefully think artists are about. RY: What attracted you to the role? Hoffman: It was a great script….it’s never just the role…it’s always the role and the story…they have to go hand in hand and this is a really a great script and it’s a role that pertains to where I am in my life…where being 40 is in your life….and I do think it’s interesting and I do think that’s the answer to your first question…it’s interesting to explore something that you find pertinent to life at this time in your life…you find that your interest and curiosities change over time. There are things that I did ten years ago as an actor that I would not want to do now as an actor. After the interview, Hoffman gracefully shook my hand and headed into the theater with good friend Linney and the rest of the cast. What has been written about the past several weeks and what will continue to be written about the late actor has opened up new conversations about drug overdose, addicts who try to fight their inner demons and personal struggle with rehab. When Hoffman tragically and suddenly passed away, the media compared his death to those of other talented actors who battled drug addiction including River Phoenix and Heath Ledger. The premise seems to be the same. When the 86th Academy Awards begins on Sunday, March 2, 2014, millions will be watching the broadcast around the world while Hoffman’s spirit will be lingering among the actors as he sends his congrats to the winners from above while fixing his trademark uncombed hair. The journey continues….and for Hoffman, it was indeed a short and unfinished one. If there is one single event that will give you a complete picture of the magic behind the largest film producing industry in the world complete with all its leading components, then you DO NOT want to miss the most talked about and highly anticipated event of 2014 soon to happen in the US for the first time. This folks, is a VERY BIG DEAL! The International Indian Film Awards known as iifa is the biggest Bollywood event produced out of India (think Oscars) and is bound for Tampa Bay, Florida April 24-26, 2014. Beautiful A List Bollywood celebrities, stunning exotic dancers, gorgeous actresses and choreographed spectacles with singers and superstars, will entertain thousands upon thousands of fans from all around the world that will come to see the live extravaganza. As someone who has been covering Bollywood for almost two decades, trust me when I tell you that iifa is the most magnificent event ever to come out of India. Now in its 15th year, the event will bring over 800 people set to perform in numerous events during the three-day celebration. In just one week since ticket sales have started, over 10K tickets have been sold for the event!! Why Tampa Bay? Glad you asked. Dr. Kiran Patel, a well-known cardiologist and philanthropist is the brains behind bringing iifa to Tampa Bay. Dr. Patel has been a life long Bollywood fan and is one of the most respected individuals in the state of Florida. International superstar and iifa representative actor Anil Kapoor spoke to The Ravi Report during the New York press conference that he and the ridiculously gorgeous Bollywood actress, Guess girl and Pitbull favorite Priyanka Chopra co-hosted. RR: Great to see you again Anil! The NY media is buzzing saying that both you and Priyanka, two well-known Bollywood stars outside of India with a strong international following, will draw a huge non-Indian audience to the iifa event. Your thoughts? AK: Thanks so much but honestly, there are many more accomplished actors who have done so much more in Bollywood than me and Priyanka that will be at iifa, so I really look to the iifa association as more of a family event and not really one that is showcased by me or Priyanka. RR: Is there a lot pressure from Bollywood for this massive event to go over well for the first time in the US? AK: Well, we do our best to entertainment those that come to iifa and try to do the best job we can as entertainers. During the press conference, Kapoor pointed out he would never bestow his name to anything that he does not believe in. Rajan Singh, head of International Business for Star Plus UK, has been a strong force behind iifa since the very beginning and is responsible for the million of viewers in 108 countries that will get to see the program. RR: Mr. Singh, the iifa event is being compared to the likes of the Superbowl combined with Rolling Stones concerts in terms of viewership. Is that a pretty accurate description? RS: Well, if you talk about the television exposure one will get with iifa with the biggest network in Asian television like Star Plus, then it certainly does fall into that kind of area. RR: iifa has been staged around the world but never in the United States. What are some of the concerns you might have with such an intense undertaking? RS:It’s going to be a quality event that is the most important thing we need to focus on.We have to produce quality events so people around the world can see how far iifa has come in the past 15 years of global exposure. RR: With leading Bollywood stars starring in big budgeted Hollywood films, popular television shows and international modeling campaigns, is Bollywood finally coming to a mainstream level in the United States with iifa? RS: I am surprised it has taken so long with America having such a huge Indian population,that it has taken 15 years for Bollywood to officially come to the US through iifa. For more information on iifa and ticket sales, visit www.iifa.com. The journey continues….in Bollywood style! Jai Ho! The Paley Center For Media http://www.paleycenter.org in NY recently held their 2013 Paley Fest featuring top stars and producers from popular television shows that have gained nationally attention and following. One of the events was an up close visit with the cast from the extremely popular and prodigious FX show The Americans. The show created by a former CIA agent himself Joe Weisberg, is based on the marriage of two undercover Soviet spies and takes place during the Regan eighties. The all star cast includes Keri Russell, Matthew Rhys and popular actor and friend Noah Emmerich. Emmerich, 48, is a New York born, Yale educated character actor who has over the past 25 years acted in some of the most memorable television shows and box office favorites. Who could forget his role as Marlon in The Truman Show with Jim Carey. Or his role as the helpful neighbor Larry Hedges in Little Children. And don’t forget to look for the talented actor in the upcoming Jane Gotta Gun playing Natalie Portman’s husband. Emmerich television appearances are to many to name but the few that do come to mind are The West Wing and White Collar. But his most recent exciting and talked about role is that of FBI agent Stan Beeman in the critically acclaimed hit series The Americans. Exciting and full of espionage drama, The Americans has captured audiences attention around the world for its brilliant writing, award-winning cast, strong character development, dramatic marital relationships and scandalous undertones. 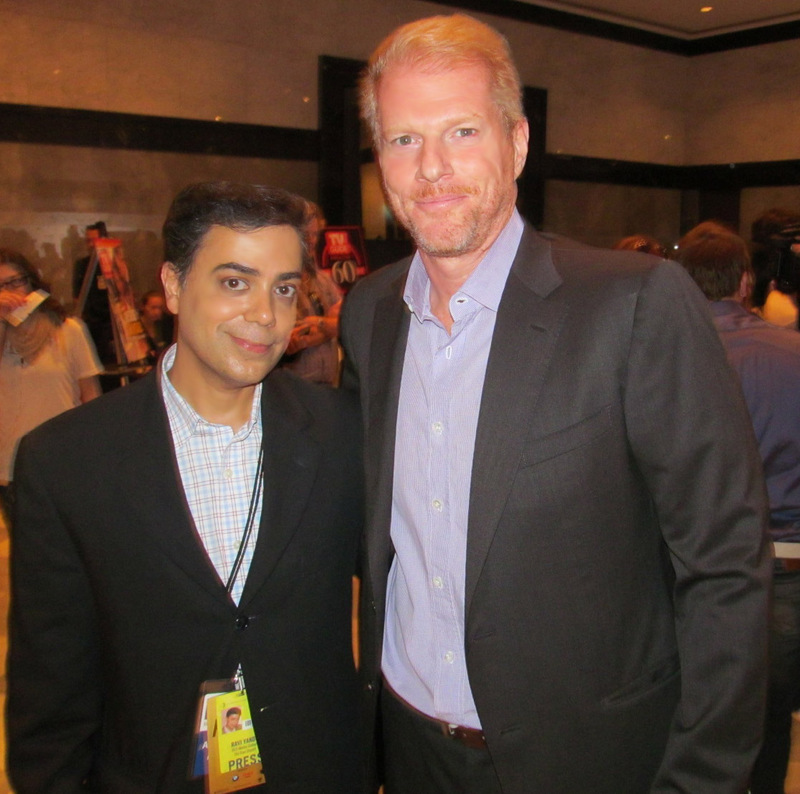 The Ravi Report recently had the opportunity to meet up with Emmerich and the entire cast and show producers at The Paley Center for a special sold out panel discussion. RR: Great seeing you again Noah. Congrats on the success of the show. How does it feel to be part of something so amazing? NE: We are gearing up for season 2 and it was amazing to come back to a job. I’ve never come back to a job in my entire life. You star in a movie, then it ends and you say good-bye to everyone. This is great. RR: Everyone loved Season 1. Are you at all surprised at the kind of prominent reaction that the show has gotten? NE: I am amazed and in my wildest dreams I did not anticipate such reaction and praises we got from the audiences. It’s like a dream. RR: You’re known in the industry as a very talented and versatile character actor in both film and television. 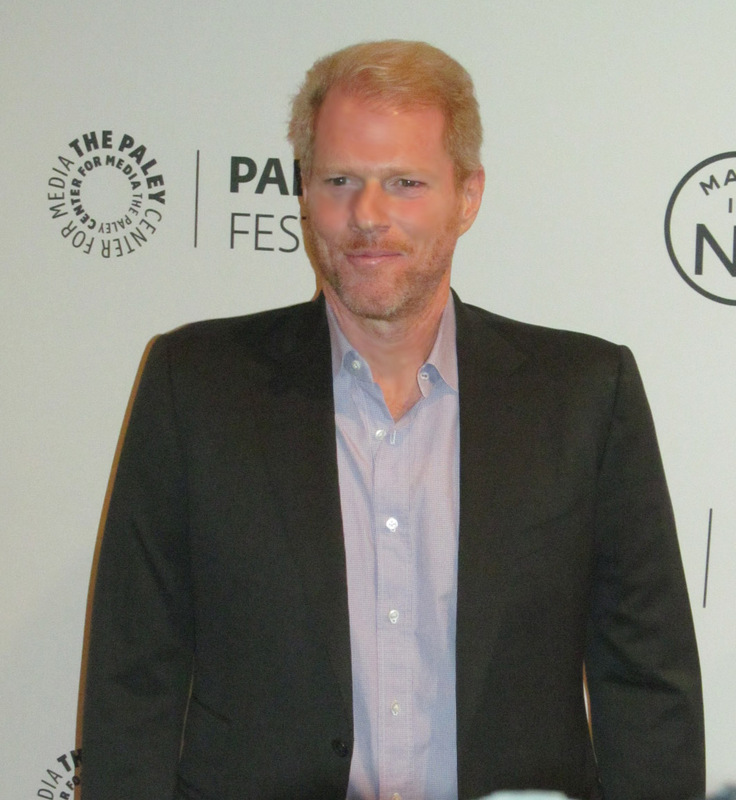 What specifically attracted you to your character Stan Beeman on the show? NE: I like the ideas of the layers of the character. They sort out infinite possibilities in the world of espionage, false identities and false selves. I like the ideas the writers had, that was really the area of interest. Another part is that it is always interesting for an actor to deal with more layers of character because the more interesting the work becomes, the more you really don’t know who these characters are to some degree. That is quite exciting for me and hopefully the audiences as well. RR: If your role in The Americans was offered to you say 10 years ago, would you have been ready to take on something so intense? NE: It’s hard to say…egotistically, I’d like to say I could have done it but I certainly feel better prepared and more suitable to play this role here today. I think everything happens for a reason and this is happening now and I am grateful. RR: What sort of research did you do for your role as the FBI agent Stan Beeman? Noah Emmerich, show creators Joel Fields and Joe Weisberg, Keri Russell and Matthew Rhys pose for the media on The Americans red carpet arrivals. NE: I’ve done a lot of reading about the period when the show takes place and I’ve talked to some FBI agents and some CIA agents as well. I somewhat immersed myself in that world to understand what the dynamics and reality was for those people during that time which certainly helped develop my character. RR: The world of television series has changed dramatically over the years with audiences getting more finicky about what they like to watch and follow. Do you think The Americans would have gotten the same kind of acceptance it has gotten today vs five or ten years ago? NE: I don’t think we could have seen the Russian heroes working to bring down America as viable as ten years ago. I think the audiences have gotten more and more sophisticated over the years in viewership and I think we, as actors, have expanded and embraced cultures and characters along the way. I also think it’s a beautiful moment that we can explore different points of view other than our own..I think there is a strong appetite for that. RR: Thank you so much Noah. Always a pleasure and good luck in season 2! Indian filmmaker Madhur Bhandarkar is a genius. Not in the Einstein sense, but in the sense of how to make great films. He knows what audiences want and goes for it. Come hell or high water. Bhandarkar, 45, is one of India’s prolific movie makers and one of the most sought after directors in Bollywood today. His reality based subject matter mixed in with his brilliant way of directing, all equals great cinema appreciated by audiences around the world. His films are fictional but have a strong sense of realism in the undertones of each story. His most recent film Heroine focused on the life of a young Bollywood wannabe actress trying to make it in the tough and highly competitive Indian film industry. The protagonist was played by Kareena Kapoor, one of the top stars in Bollywood. The film played to packed movie houses for months. Again, the Midas touch of Bhandarkar. The Mumbai born acclaimed director has won more National Awards (India’s equivalent to the Oscars) then any other director in India today. In 2009, the acclaimed director also won the India’s Presidential Award for his contribution to Indian cinema. Not bad for someone who has only been in the industry for 12 years. 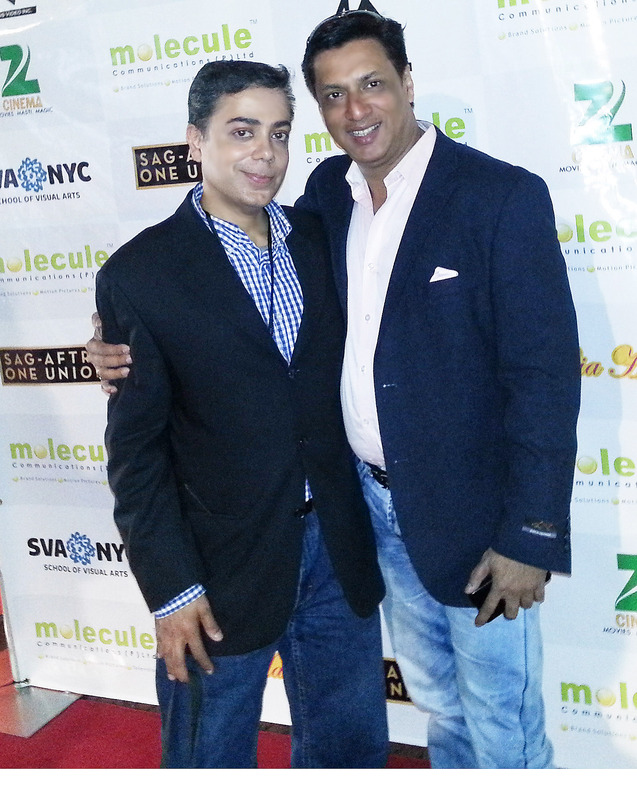 Bhandarkar was in NY recently as part of Ticket To Bollywood, a two-day amazing film conference produced by Molecule Communications showcasing Bhandarkar’s work while allowing audience interaction with the director, something of a rarity with Bollywood celebrities. “You couldn’t meet this guy in India even if you camped outside of his house for days,” said one striking Indian girl carrying a picture of Bhandarkar to get signed. “I’ve seen every one of his films. The man knows how to make films that people for generations will appreciate,” stated one beautiful Indian girl with stunning features and a statuesque build. The Ravi Report was lucky enough to catch up with the filmmaker to talk about his films, his journey and Hollywood. RR: Madhur, what I have found out is that people outside of India love your films. Are you surprised at your global fan base? MB: I think it’s a great thing. I know people who have seen Chandani Bar, Corporate and Fashion who are not Indians or NRIs who have loved my work. I am very happy about the kind of reception I have received from these film followers and a lot of American people on Twitter send me their feedback. RR: Why do you think so many followers outside of India have connected with your films? Your way of telling a story? MB: I think people understand me and most importantly, they understand my cinema. My whole journey has been a great struggle and a compelling amount of hard work has gone into it. I am happy that my journey from Chandani Bar to Heroine has been great. RR: Your films mainly deal with issues about reality such as the dark side of the world of fashion, the cut throat corporate business world and an insider’s look at trying to make it in Bollywood. Did you ever feel compelled to try another genre? MB: A lot of people have told me to stick to the kind of genre that I have been making films in and these are the films that got Madhur Bhandarkar known as the person who shows reality in cinema. I am happy about that and I am sticking to the genre and I am not going to change because my cinema..I know what it is…and for me it’s about connecting emotions with the audiences around the world. RR: You are well-known in NY and were recently honored with the prestigious ‘New York Citizen’s Achievement Award’ by the Counsel General of India. Do you have a sense of connection with New York and if so, in what way? MB: New York has been a favorite city of mine. I have been here twice already this year. I connect with New York so much because it reminds me of Mumbai in so many ways. The vibrant energy, the people, the fashion, it’s buzzing all the time and very similar to Mumbai. When I walk in Time Square, I meet a lot of people and start talking just like Mumbai. RR: One of the biggest honors any Indian person can received for his or her work is the National Award of India. Those who receive it often work a lifetime to get this high honor. You have received four of them in less than 12 years for your films and direction and are the only filmmaker in the history of Indian films to receive so many of them. Your thoughts? MB: I feel the kind of contribution that I have done with the audience participation and the people liking my work, has all contributed to me being recognized on such a high level in cinema. Everywhere I go, people say “Madhur do a film on this subject, do a film on that subject”, so the love and admiration I get from people who appreciate my work is really most important to me. RR: Are you at all surprised at the immense amount of fame and recognition that you have received in such a short time in Bollywood? MB: You see, there is an amazing amount of trust in the people and they believe in Mahur Bhandarkar cinema and they believe that Madhur will show us reality in films. Today when I look back at my journey, here is a person from a typical Marathi background who dropped out of school, sold video cassette tapes to celebrities and who came over here in this journey is huge for me. RR: Have you ever gotten discouraged on your journey? MB: I am a very optimistic person and when people ask me “Madhur, where do you see yourself ten years from now, I always go with the flow and don’t want to predict the future. I just want to make the kind of cinema that I believe in..that’s it. RR: Many top Bollywood actresses like Kareena Kapoor, Bipasha Basu and Priyanka Chopra have attributed their Bollywood success to your films. Thoughts? MB: I am happy that the audience has given me that power and that they watch my movies all the time. I am happy that my team, producers and of course the actresses have given my films their best work. RR: Would you ever decide to head to Hollywood? They are very familiar with your work. MB: Well, I am very busy now. If an offer comes tomorrow…and it’s right…I would do a film. I am just to busy right now to do anything but as I have said, if you want to work in Hollywood, you have to over there, park yourself and try to understand the process and the same goes for trying to make it in Bollywood. RR: Thank you Madhur. A true honor indeed. MB: Thank you. My pleasure. The journey continues and for Madhur Bhandarkar, it’s indeed a reel-istic one. 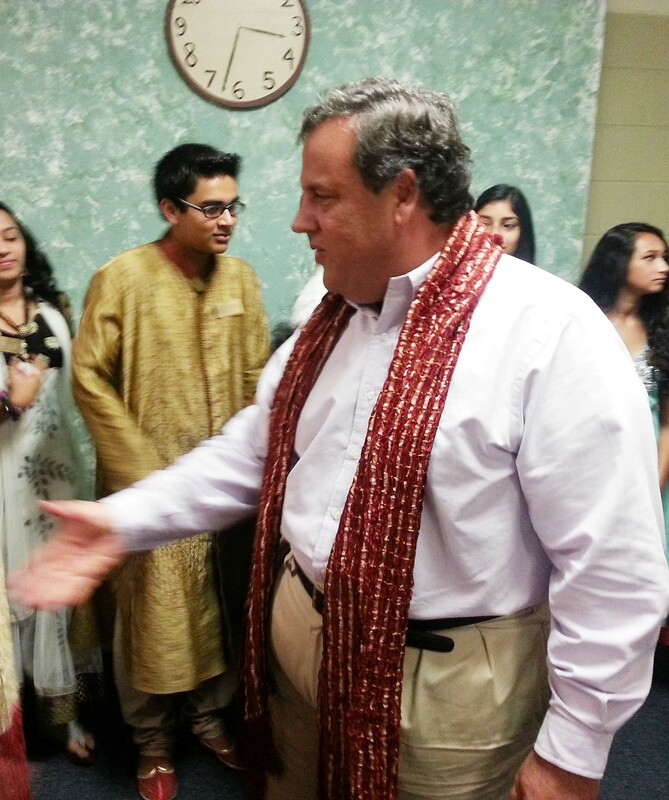 The South Asian community sure does like NJ Governor Chris Christie. 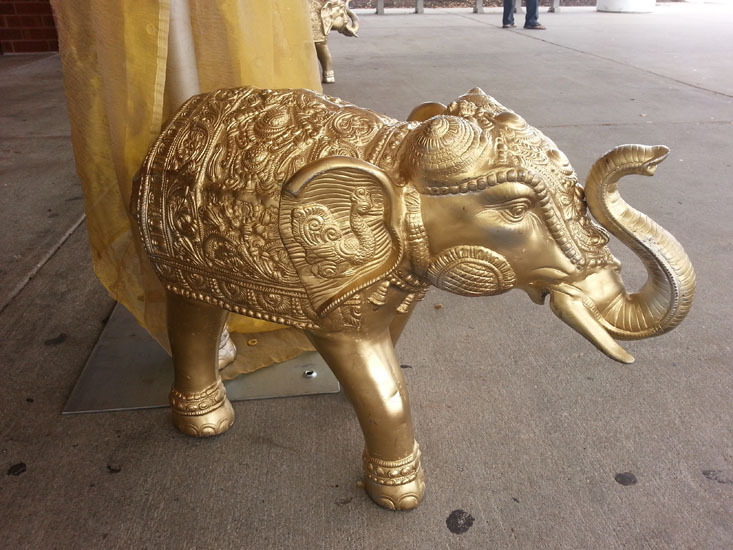 At a recent celebration in West Windsor, NJ Governor Christie was welcomed with golden elephants, beautiful Indian ladies dressed in stunning silk saris and a whole lot of enthusiasm from NJ state registered voters. “I came today just to say thanks to the Governor for doing a great job. 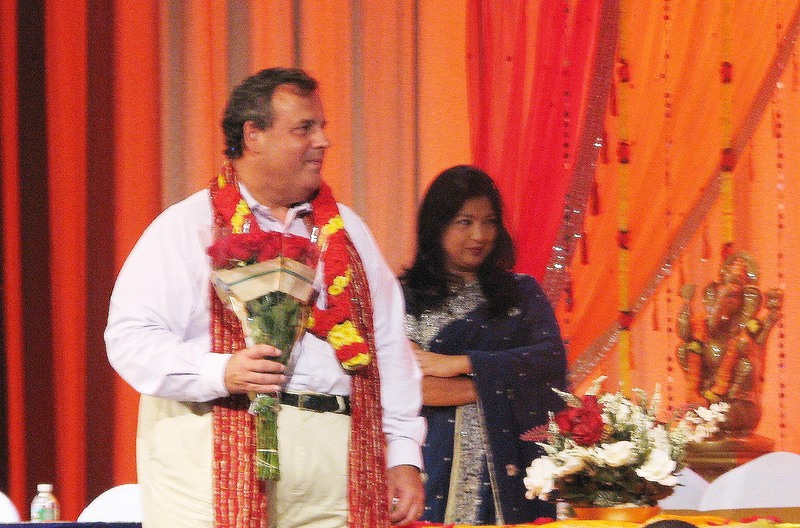 It’s tough being the Governor of NJ,” said a gorgeous Indian girl dressed in a designer Manish Malhotra chiffon sari laced with swarovski crystals. The Governor was a special invited guest at the annual 2013 Marathi Vishwa Ganesh Celebrations, a festive and religious program that welcomes the “birth” of Lord Ganesh, the popular elephant headed Hindu God known for removing obstacles from one’s path and one in which millions of Hindus across the world pray to. Coincidentally, Governor Christie has a Lord Ganesh idol placed in the Governor’s Mansion Drumthwacket in Princeton. Governor Christie being thanked by the Indian community for his hard work with Dr. Kulkarni in the background. 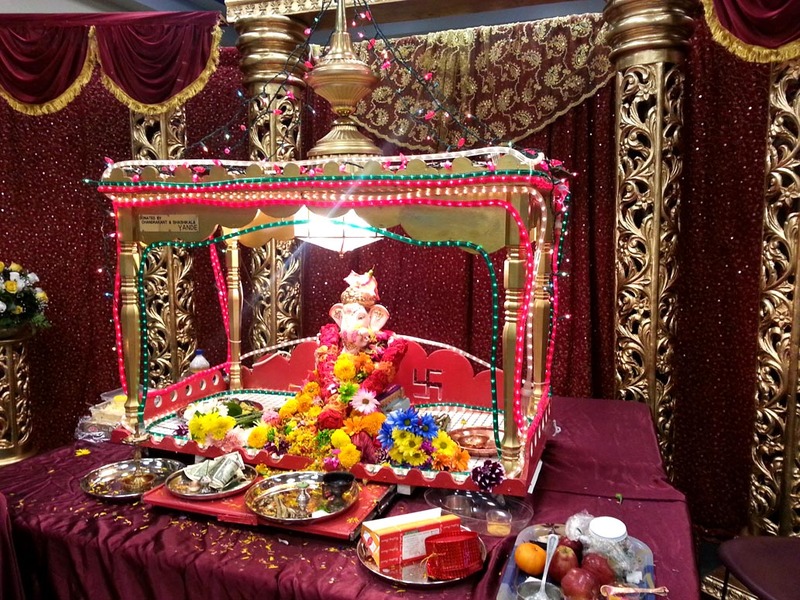 I have been attending the annual Lord Ganesh event for years now with my parents and this year the biggest attraction was the Governor’s appearance. “Our state is a state that has great opportunity but also great challenges,” the Governor told an audience of 1200 during his pin drop silence speech. A round of applause from the audience. The Governor then went on to say that New Jersey residents feel a strong connection to the 566 municipalities and to the town they live in. He also pointed out that folks who have belief in the principles that have made NJ strong like hard work, integrity, honesty, strong families and a deep believe in God, are things symbolic of the community and the state. He ended his speech with a quote from his mother. After the Governor’s speech, I spoke to a few of the guests to see what their thoughts were about what he said. “He has a very tough job and he is doing a great one. We need him again in office!” said Dr. Joshi, a physician from northern NJ. “I think the Governor was right in saying that the South Asian population is the fastest growing one in the state. 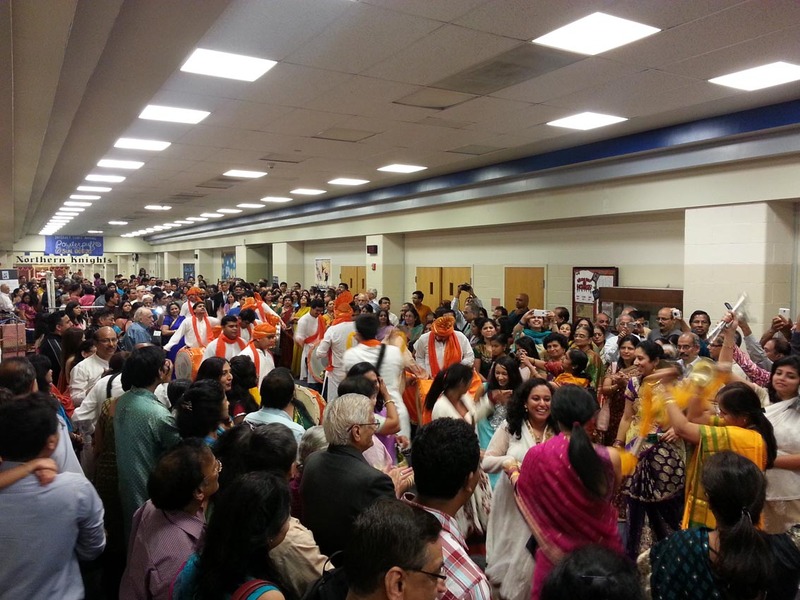 Our community is attracted to NJ for its jobs, schools and of course temples, which now has 15,” stated one gorgeous Indian lady dressed in a god brocaded silk sari and decked in gold jewelry. Afterwards, Christie took a walk to the Lord Ganesh idol to take “darshan” (auspicious viewing & blessings) with the guests. The idol was place in a handmade temple that my dad made years ago as part of the celebration. My dad adds to it ever year and this year he decided to add red lights which looked awesome! 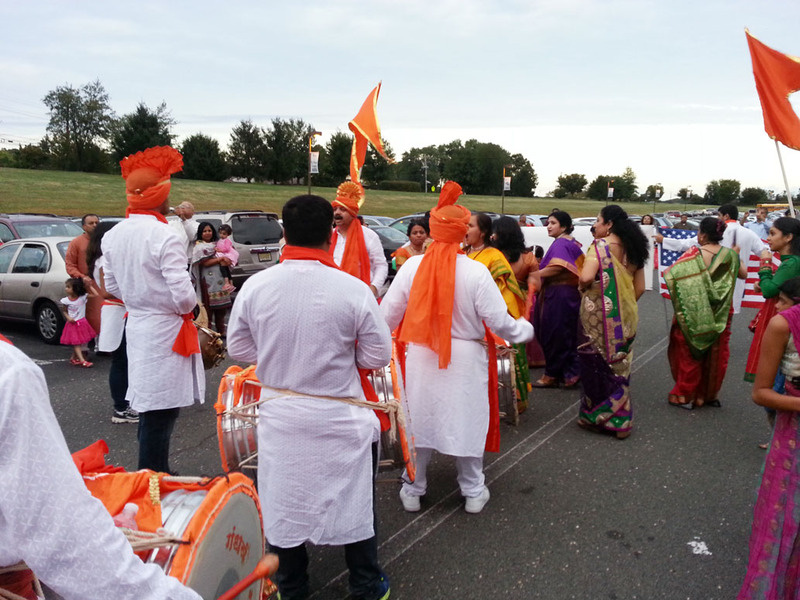 The Marathi Vishwa organization, www.marathivishwa.com, a community group of Marathi speaking people was started by my parents started over 30 years ago for the same reason what Governor Christie mentioned in his speech- to contribute to the great community of NJ. The organization which my mom named, is now going strong after 30 years with thousands of members from all over NJ. The Governor’s appearance gave the Indian community increased hope and satisfaction that he will continue to give his best to the state and its people in the next four years. The journey continues and for Governor Chris Christie, a one filled with strong support from the Indian community of the Garden State.